Artist Corner: That’s a Wrap: A brief explanation of our bathroom wall vinyl! That’s a Wrap: A brief explanation of our bathroom wall vinyl! Recently we’ve changed up our 360° decorative wall vinyl in our restroom. If you are anywhere within eyeshot of said lavatory, you will immediately notice the bright spectrum of colors of the background coupled with bold, sharp, commanding street art style imagery in the foreground. Initially, I would like to assume these images are familiar to most, but for those who may have been under a rock for three decades or for those who just need help identifying the artwork, I think a quick explanation is due. 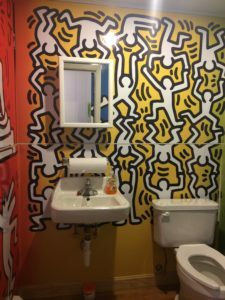 The artwork we tapped as the inspiration for the design of our restroom wall wrap is that of renowned artist Keith Haring. He is a favorite for a few of the team members here and his work is simply meant to be large scale and covering walls. Haring’s style is a perfect example of (for the most part) contemporary pop art, or for sake of argument, modern street art. A search on the internet of Haring’s work will show his trademark style – He often outlines his characters and scenes with thick black lines and is reminiscent of early modern artists like Picasso or even more contemporary artists like Andy Warhol. Haring was much like Warhol and other artists who became popular through their bold and unrelenting colors, shapes and subject matter. Haring is originally from Pennsylvania and much like anyone who grew up around his time, he was influenced by other great cartoonists of the modern age like Dr. Seuss, Walt Disney and so on. Haring originally aspired to be a commercial graphic artist, but decided to drop out of his first choice college and focus on his own solo work and exhibitions by enrolling in S.V.A in New York. This is where Haring became friends with the likes of other legendary artists such as Kenny Scharf and Jean-Michael Basquiat. If you ask me, it would seem like New York is the place where Haring’s work developed into his iconic style, which was honed by creating endless works in the city’s subways, streets, and clubs, among other spaces. A defining narrative of his work was that Haring used a seemingly simplistic approach to what are very complex feelings or subject matters. Over the course of his legendary career, Haring often devoted his time and work through public pieces which often times carried social awareness messages. Sadly he was diagnosed with AIDS in the late 80s and that would ultimately be the cause of his death in the early 90s… only a few short years later. Personally, I am always intrigued with the scenario of someone who even in a short or tragically altered existence, is still able to have such an enormous and timeless impact and stamp on the art and culture universe. If you’re familiar with Keith Haring’s work, then I hope this was entertaining but if this is the initial introduction to such an iconic and celebrated artist, then I strongly suggest a more in-depth look into such an incredible lifetime and subsequent body of work that you will not soon forget.